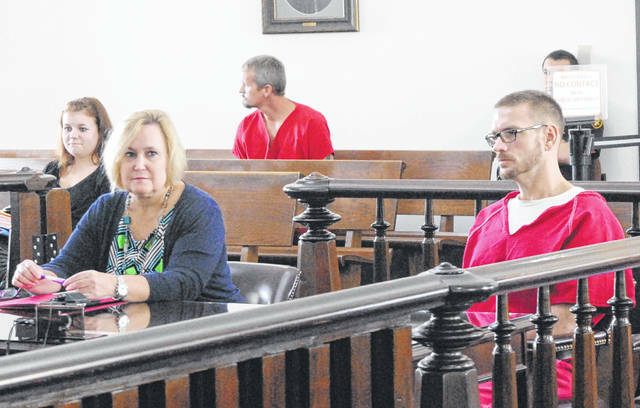 Clinton Watson, right, sits in Highland County Common Pleas Court on Wednesday with attorney Kathryn Hapner. A Grove City man was sentenced on Wednesday to three years in prison after he pled guilty to burglary in Highland County Common Pleas Court. As previously reported, Clinton Wade Watson, 39, was indicted last month on count of burglary, a second-degree felony; and one count of violating a protection order or consent agreement, a third-degree felony. According to a bill of particulars filed in the case, Watson broke into his ex-wife’s home in Hillsboro and took multiple items, including Coach purses, Ugg boots and jewelry. The bill said a neighbor told police that they saw Watson prying the bedroom window open and removing an air-conditioner unit. The stolen items were later recovered at a home in Hillsboro where Watson had been staying, according to the bill, and Watson admitted to taking them. According to the bill, Watson had a protection order disallowing him from being on the property. That charge was dismissed as part of a plea agreement. The prosecution and defense made a joint recommendation that Watson be sentenced to three years for his crime. Watson pled and was sentenced on Wednesday. In sentencing arguments, Highland County Assistant Prosecuting Attorney Jim Roeder said while Watson had only one prior felony, failure to pay child support, the defendant has “a litany of misdemeanors” on his record. Attorney Kathryn Hapner, representing Watson, said her client was dealing with substance abuse issues when he committed the crime. Judge Rocky Coss said a presentence investigation of Watson revealed that he has a history of violence. Coss said while 80 to 90 percent of defendants in Highland County Common Pleas Court are there because of substance abuse, most do not engage in violent behavior. In other hearings Wednesday, Michael Knuckles, 23, Fayetteville, was sentenced to one year in prison after he admitted to violating his probation. According to court documents, Knuckles was sentenced to three years of community control in April of this year after pleading guilty to theft and breaking and entering.